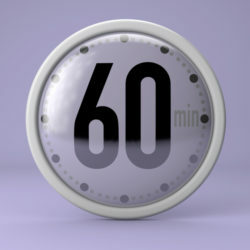 Most of us are familiar with the 80/20 Rule of Time Management. 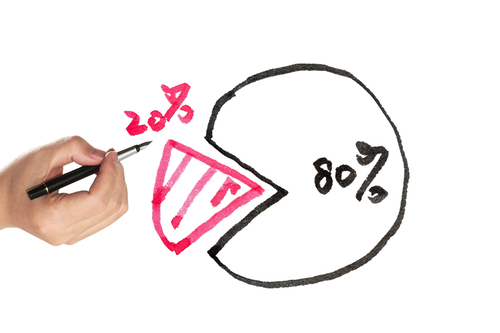 Simply put, this rule suggests that 20 percent of our efforts will account for 80 percent of our results (*). I’ve never tried to measure the accuracy of this rule, but I’m comfortable enough with its basic premise to allow it to influence how I plan my work time each day. Only recently have I been exposed to what I’m calling the 20/80 Rule of Action. And here’s how this one works. When addressing any issue needing our attention – for example, anything where we are seeking Better! Results (my MAJOR theme in these articles and my work) – we invest 20 percent of our time in analyzing the issue and its causes, and 80 percent considering and pursuing solutions. In short, the 20% mark is where the conscious directed shift or pivot occurs. I’ve been asked if I’m really that rigid in my timekeeping. And the answer is yes and no. Yes, because I do keep an eye on the clock in my meetings so I’m more mindful of our progress against the time commitment I’ve requested from others. And no, because I see the 20/80 breakdown as a target rather than an absolute. Most days I find 50/50 is pretty good. Much different from the 90% problem discussion/10% solutions discussion I see in most management meetings. First, focusing on problems leads us to the past. Focusing on solutions leads us to the future. 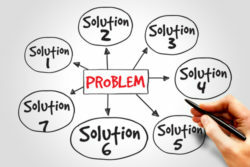 Second, problems disappear into the background as solutions develop. Agree? Let me know – especially if you don’t! But if you’re not sure it will work, why not try it and then form an opinion. That’s what I did. Now I KNOW it works. Be careful as you read this. Proceed slowly and with appropriate caution. Because what you read here may fundamentally change the way you think. Here’s a simple test. When an issue comes up – at work, home or elsewhere – what’s your focus? 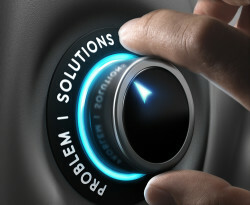 On the problem or on finding solutions? Jerry was known as a guy who could slice and dice a problem a hundred different ways. He would study, seek deep data, list variables, analyze root causes, and then be paralyzed when it came time to take actions that might actually solve the problem at hand. Co-workers and supervisors agreed: Jerry was 95% focused on analyzing the problem leaving only a spark of energy and time left to solve it. Friends and co-workers felt even more sternly about Mary Pat. When an issue needed a fix, she was the one all could depend on to complain, complain, complain. And of course, it was never her fault, so why should she even bother to get involved. Then there’s Marie. People enjoyed working with Marie. She had a habit of acknowledging an issue, putting reasonable effort into determining likely causes, and then getting her team together to put their heads down to find solutions. 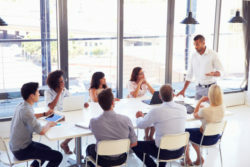 She would often call her staff into a conference room, lay out the issue in less than ten minutes, and then ask everyone to help her by brainstorming possible solutions. These free-flowing discussions would usually run for about 30 minutes, but never longer than an hour. And she expected contributions from everyone present. One of her staff summed up Marie’s approach in this short statement. “She’s 20% issues and 80% solutions. Every day.” In fact, that’s exactly what was written on a flip chart in the group’s conference room. Result: Marie and her team built a reputation for solving problems, not just staring at or dancing around them. That’s a great spin on the old 80/20 rule where theoretically 80% of our results c ome from 20% of our efforts. Put 80% of our efforts into solving problems. So here’s the test for you. When an issue comes up or a challenge needs to be addressed, what’s your focus? If you’re reading this article, I doubt you’re a complainer like Mary Pat. And few among us get so deep into issue analysis that like Jerry we simply have no energy left to choose and implement possible solutions. But do you live the balance that Marie brings? 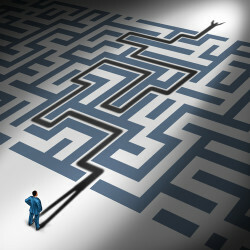 Next time you face a routine decision or complicated issue, put appropriate effort into analysis and causes. Fact-finding and analysis are certainly important. But move more quickly to solutions. Try out Marie’s time model of 20% analysis and 80% solutions. See if it works for you. It does for me! Oh, I would love to know. Did that title catch your eye? If I saw it flash up on my computer screen, I would think – exactly where is he going this time??? Well, here’s the answer – just so you can relax. It’s been 35 years since they pushed me out of college and into the real world of business with an accounting degree. I’ve worked in major public accounting firms, huge companies, boutique consulting companies, and I’ve been self-employed for most of the last 25 years. I’ve seen thousands of employees, managers and executives succeed, and just as many – perhaps more – flame out, stall and fail. With these many observations in mind, for my book Do What You Can! we made the subtitle “Simple Steps – Extraordinary Results”. It’s a catchy phrase, but to me it’s the guiding statement for much of my work. Here’s why. I’ve always sought solutions that are fundamentally effective, relatively easy to implement, and cost far less than their likely benefits. One of my favorites is that in business – and in life – you will find your effectiveness doubled, tripled or beyond if you cultivate the ability to attract the people and other resources you need to advance toward your goals. So we’re clear, I’m not talking about conning people into supporting your schemes and plans. I’m talking about being so ‘attractive’ in your work that the people you need are lining up to work with you. You are reliable. You never leave supervisors and co-workers in the dark wondering about the status of your work. And you finish your work – on time and in a high quality manner. You prepare for meetings and discussions, and bring something unexpected and positive to business projects. You are all about finding solutions to issues. You have a reputation of willingness to help other people succeed – not someone who can be taken advantage of or walked over. Rather, you are seen as a guide, coach or mentor interested in helping others grow in their own work. You have a habit of improving your technical, interpersonal, communications and administrative skills. You take it upon yourself to get the meaningful performance feedback you need, identify the blind spots and weak points in your own performance, and take daily action to improve. You are positive – even optimistic – in what you say, what you write and what you show others about yourself. You are focused on the task at hand. Not frantic. Focused. You project a calm confidence in your abilities. Especially when you are tired, stressed, frustrated, under the gun, against a deadline, or correcting others’ mistakes. Not cocky. Confident. In a calming manner. You are Present – You’re not distracted in meetings and discussions. Others notice that you put down the ‘distraction-box’ mobile device when others are present. You are Intentional – You act with Purpose. You eliminate unnecessary distractions. You produce high- quality results in your work. You are Helpful – Every businessperson I have ever met has some knowledge or skill that others in their workplace need. You know this as well, and you look for the daily opportunities to help someone else. You are amazed how many of them look for ways to help you as well. This isn’t a complete list of what to do, but it will get you started towards accelerated success. And it certainly doesn’t hurt to look your best, too. How you present yourself to others shows that you respect them (and yourself! ), and took the time to be aware of how you appear to them. Yes, appearances are often surface level and superficial; but they can matter in a business setting and should be attended to within reason. Look, you and I both know it’s not really fair to judge people by their appearance. But it happens – so why not just eliminate any concerns by decision makers about how you might present yourself to customers and others. Show them your best in your work and your appearance. Start with a genuine smile – finish by pressing your clothes and shining your shoes! In short, be attractive to others. Draw them to you with your positive energy, outstanding work and helpful disposition. Be the person they want to work with and support. Take these Simple Steps. Every day. Best wishes for your success – however you define it. In your work, what do you do so well that everyone recognizes your expertise in this one area? Who do you know who needs this skill? How could you teach them? Start with a genuine offer to help them? Go and have that conversation right now. Right away. Today. But be ready for their offer to help you. It’s not why we offer to help, but it’s going to happen. Think in advance – what does that other person know that would help you improve you skills? What’s the one skill you’ll need to master in your next job? Is it a business or administrative skill? Communications or interpersonal (writing, speaking listening, presenting, coaching)? Or maybe your internal consulting skills? Who do you know who is already a master at this skill? Approach them about coaching you. Be specific. Prepare and present a one-page proposal. Include how you will help or repay them for their efforts. Think of just one person in your work life who is able to attract others to them? Not because they are funny or pretty, but because they have a track record of teaching and helping others. Who is it? And what do they do each day that makes you feel ‘attracted’ to them and their work results? My purpose is to give you ideas you can use on your terms to advance your performance towards your goals. Please let me know what you think. Just click here to leave your own Better! ideas.